The idea of a minority ruling over the majority goes against our most basic ideas about democracy. But with First Past the Post, it's the norm. For about 90% of the time since 1935 we've had single-party 'majority' governments, but not one of them had the support of a majority of voters. The Conservatives and DUP currently share a majority of seats with just 43% of the votes. The 2015 Conservative government won an outright majority of seats with just 37% of the vote. For almost the entire modern era, politicians who most of us didn't vote for and don't agree with have had the power to govern the UK however they like. Proportional Representation means majority rule, not minority rule. With PR, any government must have a majority of votes behind it - so in order to govern, a party needs to either work collaboratively with other parties, or persuade most of us to vote for it. With First Past the Post, Parliament does not reflect the way we vote. It denies millions of people representation of their choosing. In the 2017 general election, the Green Party, Liberal Democrats and UKIP received 11% of votes between them, yet they shared just 2% of seats. The 2015 General Election was even worse. The same three parties received almost a quarter of all the votes cast, yet these parties shared just 1.5% of seats. When so many voters are denied a voice, Parliament fails to reflect the people it is supposed to represent. Millions of us go without a say in crucial national decisions - excluded not only from government, but from holding government to account. This isn't just bad for democracy; it's bad for our entire politics and society. With Proportional Representation political diversity is reflected in Parliament, not suppressed. PR makes sure the share of seats each party gets matches the share of votes they receive. If a party gets 20% of the vote, it wins 20% of the seats. Parliament would accurately represent the people's range of views and perspectives. All votes should be worth the same, right? With First Past the Post votes are not equal. In the last election it took 28,000 votes for the SNP to win a seat compared with over 500,000 for the Green Party. Almost 600,000 votes for UKIP won absolutely nothing. In the 2015 general election, it took 34,000 votes to elect a single Conservative MP, but 300,000 votes to elect a Liberal Democrat MP, 1.2 million votes to elect a Green MP, and 3.9 million votes to elect a single UKIP MP. Proportional Representation means every vote has equal value and everyone has an equal voice - wherever we live and whoever we vote for. It takes roughly the same number of votes to elect each individual MP - whichever party they happen to belong to. It isn't just who you vote for that decides what your vote is worth under First Past the Post - it's also where you live. If you live in a ‘safe seat’, where the same party wins every election, your vote is worth very little and parties have every reason to ignore you. Many seats haven't changed hands in 100 years and most have no prospect of changing at any given general election. As a result, elections under FPTP are decided by a few thousand swing voters in a small number of marginal constituencies. If just 533 people had voted differently at the last general election, it would have given us a majority government instead of a hung parliament. As a result, parties and politicians focus their efforts, resources, and even policies on these small number of voters. Campaign spending and activist footfall is higher in marginal seats than in safe seats. Governments have even been found to allocate more public spending to the marginal seats they need to win the next election. Proportional Representation means votes matter everywhere, not just in a few marginal seats. Parties and candidates have to work hard in every constituency to do well in general elections. With First Past the Post, each voter has a single MP to represent them in Parliament. For millions of us, this is someone we did not vote for and probably don't agree with. You might be surprised to hear that often most British voters end up with an MP they didn't vote for. In 3 of the last 4 general elections, at least 50% of votes went to losing candidates. This is because MPs can be elected with a very small share of the vote when there are more than two candidates standing in a constituency. In constituencies like Ceredigion, the MP was elected with under 30% of the vote, so over 70% of voters got an MP they didn't vote for. MPs may do a fine job helping all their constituents with personal problems or carrying out ceremonial roles, but they cannot represent all their constituents politically - because their constituents hold diverse and contradictory views. With Proportional Representation voters are represented, not misrepresented. Almost everyone can have at least one local, accountable MP who they voted for and who shares their views, beliefs and values - someone who they can approach with their concerns and know they will be listened to. It isn't just votes for losing candidates that go to waste thanks to First Past the Post. Votes for winning candidates above and beyond what was needed to win a particular constituency also count for nothing. A seat won by a 40,000 vote majority has the same outcome as a seat won by a single vote: both elect just a single MP. Taken together, these excess votes for winning candidates and votes for losing candidates are called 'wasted votes'. They have no impact on the makeup of Parliament or the election result. In 2017, 68.4% of votes were wasted. In 2015, this figure was 74.4%. So it's not surprising that FPTP elections suffer from low turnout. Globally, turnout for PR elections is on average 5-8% higher than for FPTP elections. Proportional Representation means very few votes are wasted. The vast majority of votes go towards electing an MP and voters can be confident that their votes will make a difference, giving everyone an incentive to take part in our general elections. When so many votes are wasted under First Past the Post, the rational question for a vote to ask stops being "who do I want to represent me?" and becomes "who can I vote for to keep out the candidate I like the least?" The result is tactical voting: voting for someone you don't really want to win just to keep out the person you dislike the most. In the 2017 election there was a huge increase in the number of people forced to vote tactically. 20-30% of voters said they planned to vote tactically to avoid wasting their votes or “letting in” their least favourite candidate - up from 9% in 2015. Political parties also try to spread their resources tactically - sometimes not standing candidates to avoid "splitting the vote" between themselves and other parties. This reduces choice for voters and leaves some areas neglected by politicians. 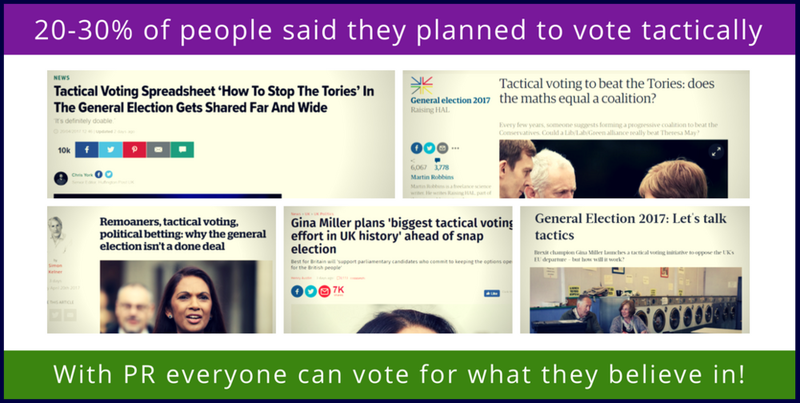 Proportional Representation means there's no need to vote tactically. Everyone can vote for whoever they believe in without fear of wasting their vote or ‘letting the other side in’. Parties don't have to worry about splitting the vote, so don't have to deprive voters of choice by choosing not to stand. It seems obvious that when a particular party gets more votes than in the previous election, that party should win more seats. On the other hand when a party loses votes, it should win fewer seats. But with First Past the Post, it often doesn't work like this. In most of our general elections since WWII, at least one of the major parties has either gained votes but lost seats, or lost votes but gained seats. This severing of the link between votes and seats is completely undemocratic. A party that loses votes should never be rewarded with additional seats - yet in elections like 1983 parties lost hundreds of thousands of votes, only to be handed dozens of additional seats. At other election - like 2010 - parties have gained hundreds of thousands of votes but lost many seats. Proportional Representation closely links power to public support. When more people vote for a party, that party wins more seats. When voters abandon a party in droves, that party loses seats. Parties no longer become more powerful despite losing votes, or lose power despite gaining in public support. First Past the Post cannot even perform the most basic task of a voting system: making sure the party with most votes wins the most seats. We've had two "wrong winner" elections in the last 70 years. In 1951, the Labour Party had it's best ever general election result and won 48.8% of the vote - the highest share of the vote it has ever won. But thanks to FPTP, Labour's Attlee government was thrown out of office and replaced by a Conservative majority government, even though the Tories won fewer votes. And in February 1974 Labour won the most seats despite the Conservatives winning the vote. Two wrong winners in this timescale is by no means unusual. Canada - with FPTP - has had two over the same period. New Zealand had two wrong winner general elections in a row before they ditched FPTP in favour of PR. The US has had several wrong winner elections to its House of Representatives (using FPTP) and of its President (using the closely related Electoral College). Proportional Representation means no more "wrong winner" elections. The party that gets the most votes wins the most seats. For the first time in British history, we could be sure that the party that won the vote would also win the election. First Past the Post encourages short-sighted, confrontational politics. Small changes to parties' popular vote can have dramatic consequences: kicking out or ushering in "majority" governments on a minority of the vote, or sweeping away most or all of the seats held by a smaller party. This encourages politicians to exaggerate their differences and focus on discrediting the other parties, rather than working together to seek the best solutions in the interests of the whole country. Decisions which need to be made, but which might prove unpopular, are routinely deferred until after the next election - often repeatedly. It also creates frequent swings between periods of polarised left-wing and right-wing government, with each side undoing rather than building on the work of its predecessor. First Past the Post is not decisive. Two of the last three elections have resulted in hung parliaments, while at the same time failing to reflect the voters. The other resulted in a tiny majority and the most disproportionate parliament in history. First Past the Post is not stable. We’ve averaged one unplanned election every ten years over the last Century; more than the average for countries that use PR. 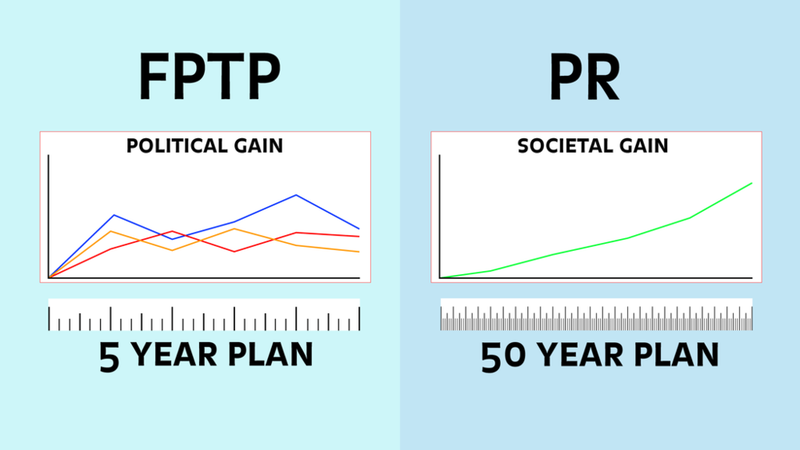 Between 1945 and 1998, countries with FPTP had more elections on average than those with PR. First Past the Post does not allow voters to “kick out” unpopular governments”. In most of our general elections, one of the major parties either loses votes but gains seats or vice versa. FPTP totally severs the link between public support and political power. First Past the Post does not provide a "strong local link" between MPs and their constituents. It frequently means that most voters have an MP they didn't vote for, don't agree with on political issues, and do not trust to represent their views in Parliament. First Past the Post is not simple. It may be simple to write an "X" next to a chosen candidate, but it's incredibly difficult to know what that vote will mean. Millions of voters are forces to try to vote tactically by anticipating the decisions of other voters. First Past the Post is not "the least flawed voting system". Systems of Proportional Representation can avoid all of the problems set out above, and are used by the worlds most democratic, equal and stable societies.